Sigrid V. Carlsson, MD, PhD, MPH, is an Assistant Attending Epidemiologist at MSK with 13 years of prostate cancer research experience and over 85 publications. Her PhD thesis stemmed from the world’s largest study of prostate cancer screening, the European Randomized Study of Screening for Prostate Cancer (ERSPC), which investigated how quality of life was affected by screening and treatment. Before pursuing postdoctoral studies in urologic oncology at MSK, Dr. Carlsson was a physician in Sweden. She obtained an MPH degree from Harvard T.H. Chan School of Public Health. Currently, Dr. Carlsson’s research focuses on developing risk-stratified approaches to screening, diagnosis, treatment, and follow-up of prostate cancer patients. She is also the PI of a study funded by the Patty Brisben Foundation to improve the method of asking questions about women’s sexual health. She is a co-investigator on a multi-center study funded by Movember (PI: Andrew J. Vickers, PhD) that evaluates the impact of survivorship care plans and navigation tools on patients with prostate cancer after radiotherapy. 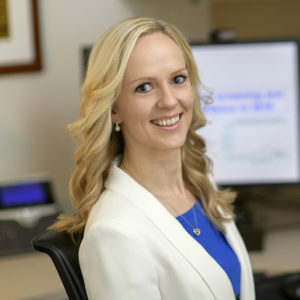 She is a co-investigator on two NIH-funded research projects, one of which investigates biomarkers and risk stratification in localized prostate cancer (PI: Hans Lilja, MD, PhD). The second project is focused on developing models to improve prostate cancer outcomes across diverse populations (PI: Ruth Etzioni, PhD). Prostate Cancer and Early Detection: Should We Follow the NCCN Guidelines? Sigrid V. Carlsson, MD, PhD, MPH, compares the National Comprehensive Cancer Network (NCCN) Prostate Cancer Early Detection v2.2018 guidelines to Memorial Sloan Kettering Cancer Center (MSKCC) recommendations for prostate cancer screening in terms of optimizing oncological benefits and reducing negative effects on quality of life. 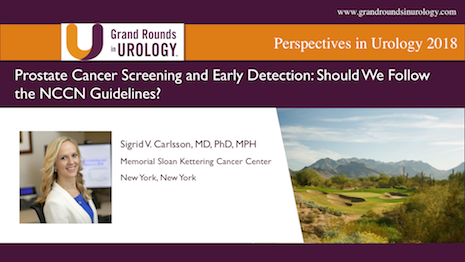 Sigrid V. Carlsson, MD, PhD, MPH, reviews the history of PSA screening, from its discovery to the controversy related to United States Preventive Services Task Force (USPSTF) gradings during the current era. She also assesses the harms and benefits of PSA screening and responsible application of the PSA test. Sigrid V. Carlsson, MD, PhD, MPH discusses the psychology, history, and practical application of shared decision making. She then provides recommendations for clinicians counseling patients deciding whether or not to undergo PSA screening and if they should go on active surveillance.